We are pleased to announce the opening enrollment for the Summer 2019 Brazil Professional Soccer School Tour. Join coaches Beto Dos Santos, Ze Luiz Sobrinho, Julio Castillo, Baltazar Ayala and Andrew Carman on our annual pilgrimage to the soccer Mecca of the World. Congratulations on being selected as an invitational player for the 2019 Brazil Pro Soccer School International Tour. The Tour will travel to Brazil for tournament competitions, friendly matches, professional Brazilian training, and culture. We are excited to save you a spot on our roster. We are confident that not only will you have fun, but also you will improve your skills and knowledge of soccer play. For more than 12 years we have organized our annual tour and this year promises to be the best ever. 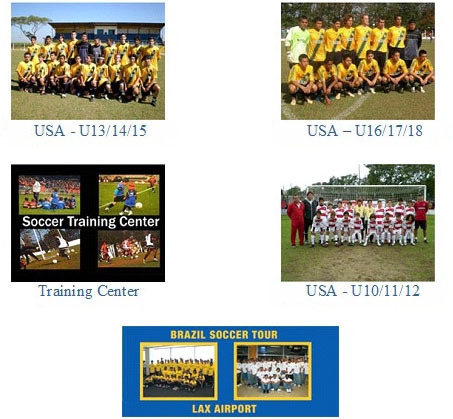 Training, clinics, friendlies, and tournaments are scheduled with some of the top professional clubs in Brazil. This once-in-a-lifetime opportunity is designed to immerse the participant in both the spirit and culture of Brazilian soccer. For fourteen day, participants will train under the direction of Brazilian coaches from an elite, professional academy and compete with some of the most talented soccer players in the world at their age level. Our past participants enjoyed a real advantage with college recruiters with this prestigious course on their resume. The tour leaves Los Angeles, California between July 14th and July 16th, 2019 for fourteen days. Individual players or whole teams can be accommodated for boys between the ages of eleven and eighteen. Parents and coaches are welcome to travel with the boys. The tour is centered in the heart of Brazilian soccer in the state of Sao Paulo. The all-inclusive itinerary is designed to provide non-stop learning experiences and new relationships that will be cherished for a lifetime.